The M.V. DOULOS was originally a freighter. Hull number 176 was built at Newport News Dockyard in the state of Virginia, in the USA. Launched on 22 August 1914 she was christened the SS MEDINA. She was a cargo ship transporting fruit and vegetables from Galveston, Texas to New York. During the Second World War was requisitioned by the United States Coast Guard. In 1948 a Panamanian company, Cia Naviera San Miguel SA, acquired the SS MEDINA. The following year she was converted to a migrant ship at La Spezia, Italy and renamed SS ROMA. In 1950, a Roman Catholic Holy Year, she was employed in transporting pilgrims to Rome. She then made a number of emigrant voyages to Australia, however, she does not appear to have been very successful in this latter role and was soon laid up and offered for sale. In 1952 the SS ROMA was sold to Giacomo Costa fu Andrea (Linea “C”) in Italy and renamed FRANCA C.
Her original steam engines were replaced by more powerful diesel and she was again remodeled, this time into a first class, luxury liner. 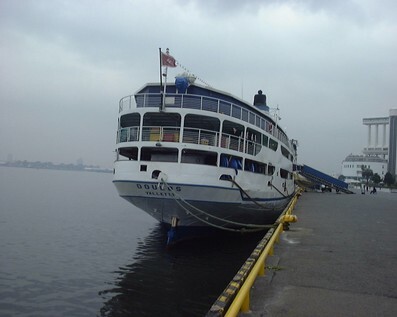 She was initially employed on her owner's South American services, and then as a cruise ship. Her cruises were mainly from Venice to the Greek islands and other Mediterranean ports, though occasional trips were made to the Black Sea or across the Atlantic. At this stage of her career several alterations were made to the ship. The most important of these occurred in 1970 when a new set of FIAT diesel engines was installed. In 1977, due to the emergence of newer cruise ships, it was decided that the FRANCA C would finally be sent to the scrapyard. Several representatives from the German company “ Gute Bucher fur Alle” (Good book for all) were on board for her final cruise. They had been looking for a suitable ship to operate but had been unsuccessful in their search. After further investigation they decided to purchase the vessel and on 4th November 1977 a formal agreement was signed. 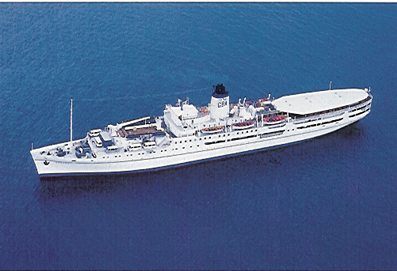 The FRANCA C was renamed DOULOS a Greek word meaning, “service”. This was the seventh time that this historic ship had been rescued from the scrapyard. Following her purchase she was dry docked at Genoa, Italy where a number of repairs were completed, including the replacement of a large section of her bow. The swimming pool on the boat deck was removed and a large canopy erected for the housing of an extensive book exhibition. 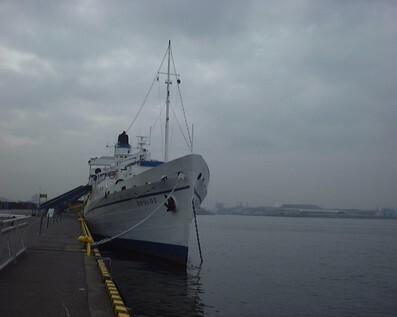 On the 3rd June 1978, after being fitted out in Bremen West Germany, the DOULOS embarked upon her new service as a floating book exhibition and conference center. Major Refits 1949, 1953, 1970, and 1993. Oldest active passenger ocean-going ship. Operating now as an International Educational and Christian service vessel. M.V. DOULOS carries a stock of half a million books. sports, hobbies, cookery, the arts and philosophy. These books are chosen to meet the educational and social needs of the local community; a large selection is devoted especially to children. Local language materials often supplement the vast array of English books. From the Captain to the cook, the crew aboard is volunteer and committed to serving the people of the world and sharing the reality of Christ with them. The DOULOS together with LOGOS II are part of the worldwide ministry of Operation Mobilisation (OM), a Christian training movement.